Leave a review for CareSoft Elite RC Twin! Our CareSoft Elite RC® series offers double the efficiency, removing harmful disinfectants and other contaminants to assure the safest, purest water for your family. But what if you could have this same efficiency any time, day or night? Our exclusive twin softeners automatically switch to a reserve tank when the main tank has exhausted its softening capabilities. So, your family will have the highest quality water from the safest system on the market 24/7! To learn more about our CareSoft Elite RC® twin series, find a local dealer near you today! 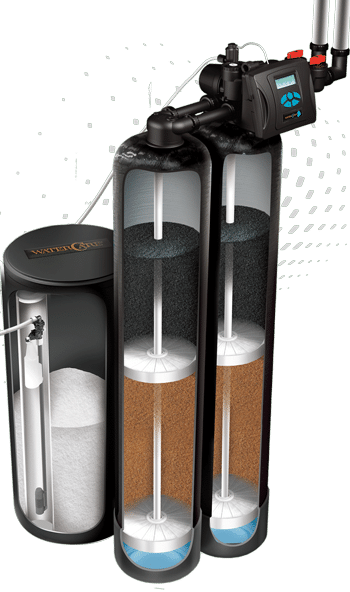 Our CareSoft Elite RC® system is perfect for city water, as the unit effectively filters out smelly odors, disinfectants, and other harmful contaminants. Our twin unit provides the same efficiency with the added confidence of a reserve tank. Meaning, if your first tank has reached its softening capacity, the supply tank will take over. Choose a system that does more, a system that assures safe, clean water for your family, a system that filters out odors and contaminants. Choose the CareSoft Elite RC® twin tank system! A low-maintenance system with automatic cleaning cycles.